I get COLD, really cold, all winter long, so cold! I decided I needed a glove for my chest, something thick and warm; a vest that would hug my torso and keep my core body temperature on the ups. So, I envisioned this, and made it in a weekend! You gotta love super chunky yarn for the speed in which you can whip out something to keep you from freezing. 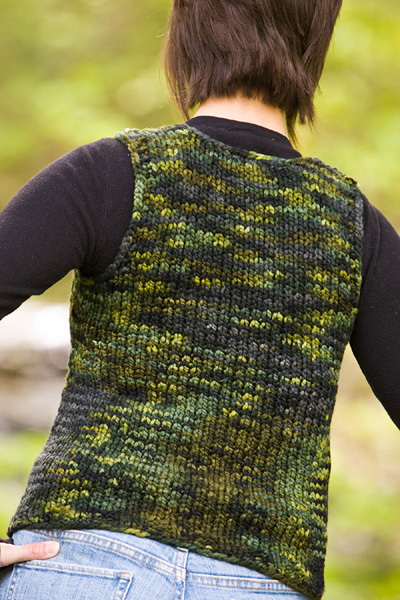 To get the hug [abrazo in spanish], this pattern is designed to fit with 2” of negative ease. 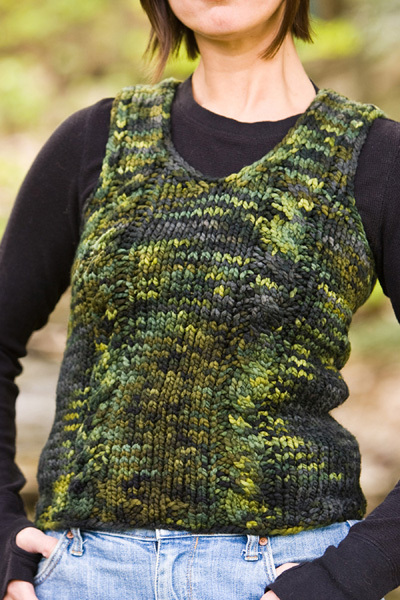 There are simple cables going up the front princess seams of the vest, terminating before the shoulder seams to eliminate any unflattering bulk -- a little design element that breaks up any knitting monotony and creates even more cling! Note: This pattern is designed to be worn with 0-2 inches of negative ease. Note: The larger needle(s) (US #13/9mm) are used to obtain the gauge given below. Smaller needles should be two sizes smaller than larger needles. 9 sts/14 rows = 4 inches in stockinette stitch using larger needles. C4B: Slip next 2 sts to cable needle and hold to back of work; k2, k2 from cable needle. C4F: Slip next 2 sts to cable needle and hold to front of work; k2, k2 from cable needle. Round 1: P1, C4B, p1. Rounds 2-6: P1, k4, p1. Round 7: P1, C4B, p1. Rounds 8-10: P1, k4, p1. Row 1 [RS]: P1, C4B, p1. Even-Numbered Rows 2-10 [WS]: K1, p4, k1. Rows 3, 5 [RS]: P1, k4, p1. Row 7 [RS]: P1, C4B, p1. Row 9 [RS]: P1, k4, p1. Round 1: P1, C4F, p1. Round 7: P1, C4F, p1. Row 1 [RS]: P1, C4F, p1. Row 7 [RS]: P1, C4F, p1. 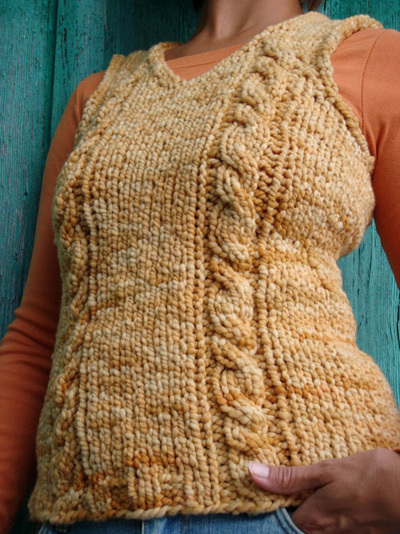 Instructions for basic crochet stitches can be found here. Using smaller needle(s), CO 64[72, 76, 84, 92, 104, 112] sts. If using double-point needles, divide sts between needles. Join to begin working in the round, being careful not to twist. Place marker which is different from others; this will be end-of-round marker. Round 1: P1[1, 2, 2, 2, 1, 1], [k2, p2] 1[1, 1, 1, 1, 2, 2] times, k2, place first marker, p1, k4, p1, place second marker, [k2, p2] 1[2, 2, 3, 4, 4, 5] times, k2, place third marker, p1, k4, p1, place fourth marker, [k2, p2] 1[1, 1, 1, 1, 2, 2] times, k2, p1[1, 2, 2, 2, 1, 1], place fifth marker, p1[1, 0, 0, 0, 1, 1], [k2, p2] 7[8, 9, 10, 11, 12, 13] times, k2, p1[1, 0, 0, 0, 1, 1]. Round 2: Work all sts as for Round 1. Round 3: Work in pattern as set to first marker, work Round 1 of Left-Twist Cable over next 6 sts, work in pattern to third marker, work Round 1 of Right-Twist Cable over next 6 sts, continue in pattern as set to end of round. Round 4: Work as for Round 3, working next round of Cable patterns between markers as established. Next Round: Using larger needles, k to first marker, work next round of Left-Twist Cable, k to third marker, work next round of Right-Twist Cable, k to end of round. Continue in pattern using larger needles, working sts between markers in Cable patterns as set and all other sts in stockinette st, until work measures 6.5[7, 7.5, 8, 8.5, 9, 9.5] inches. Note: As written, narowest point of waist shaping is approx. 4.5[5, 5.5, 6, 6, 6, 6.5] inches below beginning of armhole. If you wish to work the waist shaping higher or lower than this, adjust length now. Round 1: K1, ssk, work in pattern to 3 sts before fifth marker, k2tog, k2, ssk, k to last 3 sts, k2tog, k1. 60[68, 72, 80, 88, 100, 108] sts. Round 4: Work as for Round 1. 56[64, 68, 76, 84, 96, 104] sts. Rounds 5-7: Work in pattern as set. Round 8: K1, kfb, work in pattern to 2 sts before fifth marker, kfb, k2, kfb, k to last 2 sts, kfb, k1. 60[68, 72, 80, 88, 100, 108] sts. Rounds 9-10: Work in pattern as set. Round 11: Work as for Round 8. 64[72, 76, 84, 92, 104, 112] sts. Continue in pattern until work measures 13[14, 15, 16, 16.5, 17, 18] inches or desired length to underarm, ending with an odd-numbered round of Cable patterns. Make a note of last round worked. Place first 32[36, 38, 42, 46, 52, 56] sts (all sts between first and fifth markers) on stitch holder or spare circular needle. Upper back will be worked over remaining 32[36, 38, 42, 46, 52, 56] sts. BO 3[3, 3, 4, 4, 5, 5] sts at beginning of first 2 rows. 26[30, 32, 34, 38, 42, 46] sts. BO 2[2, 2, 2, 2, 3, 3] sts at beginning of next 2 rows. 22[26, 28, 30, 34, 36, 40] sts. BO 1[1, 1, 1, 2, 2, 2] sts at beginning of next 2 rows. 20[24, 26, 28, 30, 32, 36] sts. Next Row [WS]: P1, k1, p to last 2 sts, k1, p1. Next Row [RS]: K1, p1, k to last 2 sts, p1, k1. Repeat these 2 rows until work measures 19.5[21, 22.5, 24, 25, 26, 27] (6.5[7, 7.5, 8, 8.5, 9, 9] inches from beginning of armhole), ending with a WS row. Row 1 [RS]: K1, p1, k4[5, 5, 5, 6, 6, 6]. Turn work. Row 2 [WS]: P4[5, 5, 5, 6, 6, 6], k1, p1. Work Row 1 once more. Break yarn and place these 6[7, 7, 7, 8, 8, 8] sts on st holder. Rejoin yarn to remaining 14[17, 19, 21, 22, 24, 28] sts with RS facing. Row 1 [RS]: BO 8[10, 12, 14, 14, 16, 20] sts, k to last 2 sts, p1, k1. 6[7, 7, 7, 8, 8, 8] sts. Row 2 [WS]: P1, k1, p to end. Row 3 [RS]: K to last 2 sts, p1, k1. Break yarn and place these sts on st holder. Place held sts of Front on needle and rejoin yarn with WS facing. Continuing in pattern as set, work the 6 armhole BO rows as for Back. 20[24, 26, 28, 30, 32, 36] sts. Work 1 row (a WS row) in pattern as set. Shape neckline as follows, continuing in Cable pattern as set. After next Row 1 or Row 7 of pattern, discontinue working cable twists; work the 4 cable sts in stockinette st from this point. Continue working the 1-st column of reverse stockinette st at the armhole edge until the piece is complete. Row 1 [RS]: Work 7[9, 10, 11, 12, 13, 15] sts in pattern, k2tog, k1; place remaining 10[12, 13, 14, 15, 16, 18] sts on st holder or spare needle. Row 2 [WS]: P2, work in pattern to end. Row 3 [RS]: Work in pattern to last 3 sts, k2tog, k1. Repeat Rows 2-3 2[3, 4, 5, 5, 6, 8] times more. 6[7, 7, 7, 8, 8, 8] sts. Continue in pattern until work measures same as back to shoulder. Graft sts to held sts of left shoulder. Place held front sts on needle and rejoin yarn with RS facing. Row 1 [RS]: K1, ssk, work in pattern to end. Row 2 [WS]: Work in pattern to last 2 sts, p2. Repeat these 2 rows 3[4, 5, 6, 6, 7, 9] times more. 6[7, 7, 7, 8, 8, 8] sts. Continue in pattern until work measures same as back to shoulder. Graft sts to held sts of right shoulder. Work 1 row single crochet around armholes, and across back neckline edge. Weave in all ends. Block vest. Laura learned to knit 4 years ago and got so thoroughly obsessed she had to get a job at a yarn company so she could be around fiber ALL THE TIME. 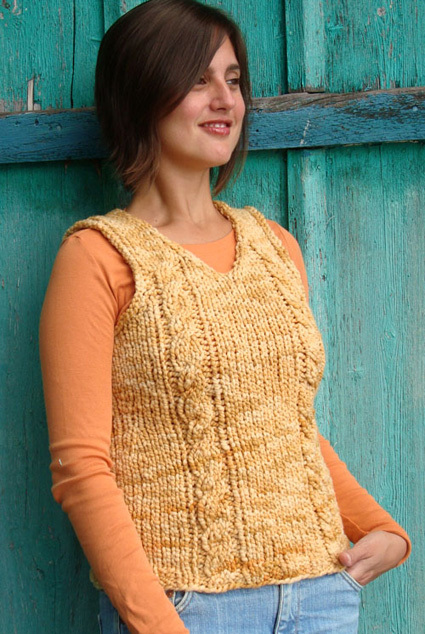 She is currently the design director at Schaefer Yarn Company. When she isn't designing and knitting, she is gardening, whipping up yummy feasts with her family, and taking time to play!